My love of photography began forty years ago owning a travel agency and traveling to exotic destinations, giving me the opportunity to photograph many challenging people and places. In 1999, I was tutored by a professional photographer friend who felt I had the talent and eye for it. I love photography and look forward to making friends with the people who come to us. I would describe myself and staff as “social photographers”, concerned about photographing the essence of families and events in sensitive, caring ways that captures all your special personal moments while establishing a friendly, relaxing relationship with us. Our photo style is “hang loose” and spontaneous, as we believe having fun and being relaxed is essential to capturing quality pictures. I enjoy family portraits, taking leisure time for everyone to feel at ease. Dads even go away saying they’ve had fun! I’m an animal lover and have three dogs and a parrot. Norman, my basset hound, is the “shining star” of my heart and is our “mascot” as you can see in our logo above. His unique personality captures the essence of the fun, which we are. We do enjoy photographing animals. Our large waterfront property is a great place for pets to sniff around and feel at home. We specialize in senior and graduation photos for the teens. Because of our colorful summer garden and lovely waterfront location, we do many beautiful outdoor portraits here, also traveling to the beach, parks and other locations upon request. Click Here To View Photos of Our Beautiful Location…. We’re known to be one of the best values in town while still maintaining high standards of quality. We feel the photos on this website will speak for themselves. We want to work with you to make the professional capturing of your portrait and wedding memories a reality. Please call to share your needs with us. We should be able to structure a package suitable to most budgets. I worked in the field of social work for over 20 years. So, I like helping people. Janet says that I have a natural eye for photography. My style is quiet and unobtrusive – you’ll hardly notice all the photos I will be taking! I love doing this and I enjoy helping people on their special day. 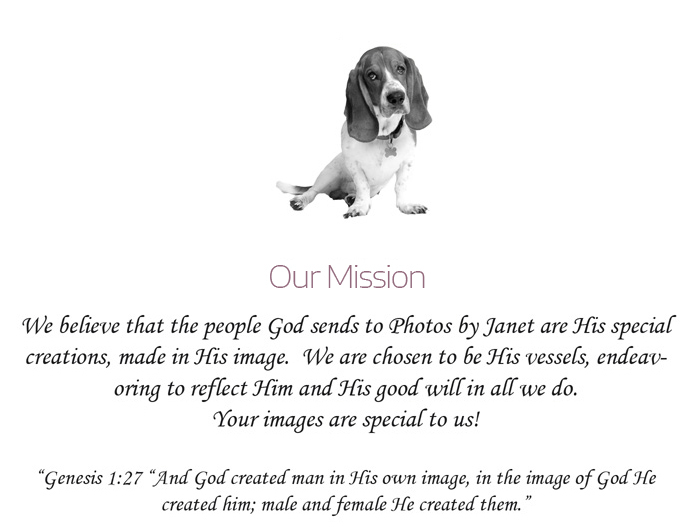 I feel blessed to be part of Janet’s “team”. Several years ago I retired from working with the government and am excited about being able to work full time now with my lifelong love of photography. Janet calls me her “dancing photographer” because I can’t sit still. I have to always be out in the middle of where the action is. I love people, I love photography and I love to have fun.